For the first time in more than a year, Tabitha Abbo holds her son Solomon, who no longer recognizes her. It takes an entire day, and costs a small fortune, for Florence Babirye to get from her home in the Ugandan village of Kasolwe to the Kayunga police station. First there’s a motorbike taxi from the village to the nearest bus stop, then a bus to Kamuli town, a Nile crossing by ferry, and a long walk. At the police station, she inquires again about her daughter, and her niece and nephew, who have been taken away to America. But the answer she gets is always the same: The children are no longer yours. 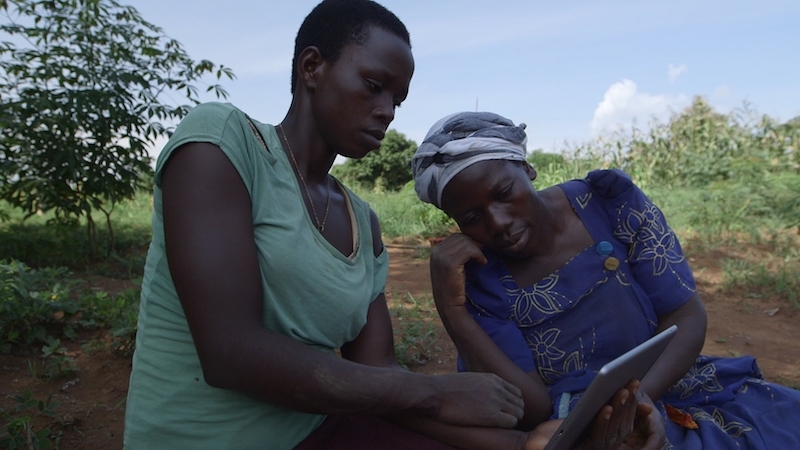 In her picturesque village, where chickens scratch among the flower beds and generations live side by side, Florence shared the responsibility for bringing up her kids with her sisters, Jenipher Rubuga and Mariam Nakiranda; extended families tend to be very involved in raising children in Uganda. 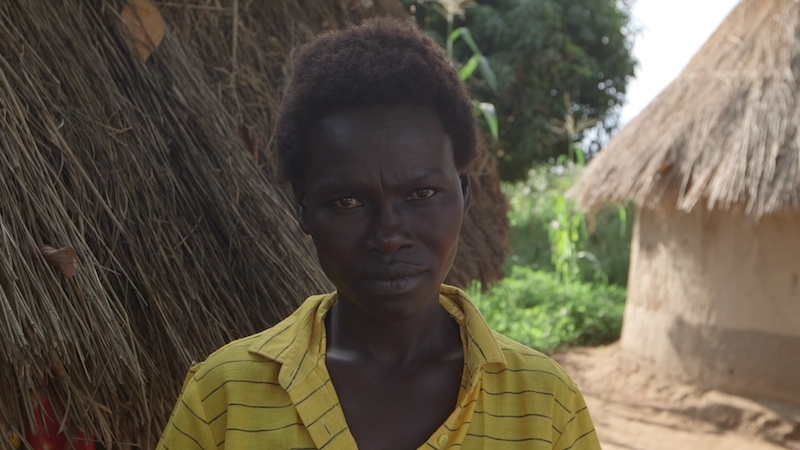 The three sisters had a total of 16 kids, who moved freely between their homes in neighboring villages. 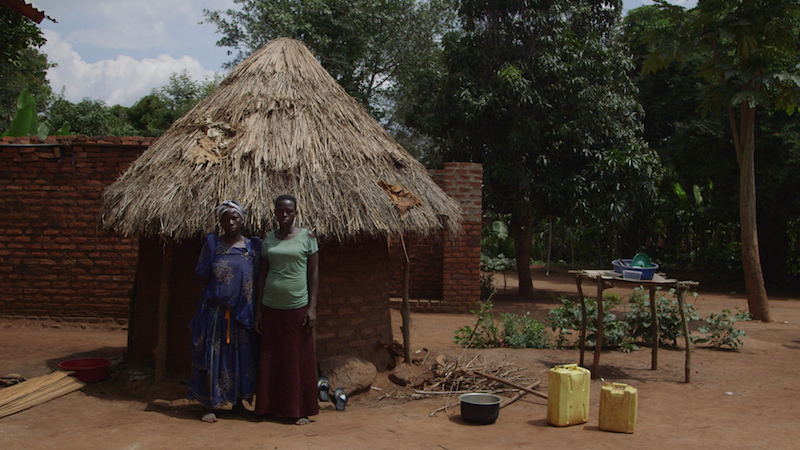 But in 2012, Mariam’s husband died, and she moved to work in the town of Mpunge, in Mukono district, several hours away by bus. Florence’s long hours at a restaurant made it difficult to look after her 4-year-old daughter, Rose Patience, so when Mariam offered to take her in, Florence readily agreed. When Rose first went to stay with Mariam, Florence didn’t own a phone, so she kept tabs on her daughter via friends and relatives. Through this grapevine, Florence heard that Mariam had met a pastor who said he could find a sponsor to cover Rose’s fees at a boarding school where he served as a director. The three sisters had often talked about wanting a better education for their children. Once she heard about her sister’s decision, Jenipher decided to entrust her two toddlers, Fatiya and Kirya, to Mariam so they could be educated, too. At first, Florence and Jenipher were happy with the arrangement: With only their older children to look after, they could work the hours they needed. They believed that their three little ones had been placed at a boarding school in Entebbe, an hour from the Ugandan capital of Kampala. It seemed like a stroke of luck. Unscrupulous brokers, weak institutions, and inadequate reforms have led hundreds of Ugandan children to be separated from their families in recent years. In 12 international adoptions from Uganda to the U.S. between 2010 and the present, we located the biological families of each of the children, all of whom said either that they'd been tricked into signing away their parental rights, or that the paperwork had been forged. Their stories illustrate how easy it is to create a “paper orphan” in Uganda for America’s adoption market, and how some US adoption agencies willingly ignore red flags, including irregularities in the paperwork or missing documents. Oregon agency Journeys of the Heart was involved in 5 of 12 cases we investigated. Their Kampala orphanage director admitted to bribing officials to "facilitate" adoptions. She said the agency's director threatened to shut down the orphanage if she didn't provide enough children. In 2016, the Ugandan government amended the adoption law to try to protect Ugandan families. But our investigation, which involved the review of hundreds of pages of court records and roughly 50 interviews shows that the amended law has fallen far short of its goal. Meanwhile, the U.S. accrediting agency responsible for regulating adoption agencies says they don't have the capacity to do in-country investigations, while the U.S. State Department, which does, says it relies on its accreditors to monitor agencies. Now the sisters were truly frightened. Mariam still refused to answer their questions. Florence and Jenipher went to the police to report their children missing. The police launched an investigation, and filed human trafficking charges against Mariam. The ensuing court case revealed that Mariam had claimed to be the mother of her sisters’ children and signed them over to Pastor Rashid. He then facilitated their adoption in America, in partnership with a US-based agency. 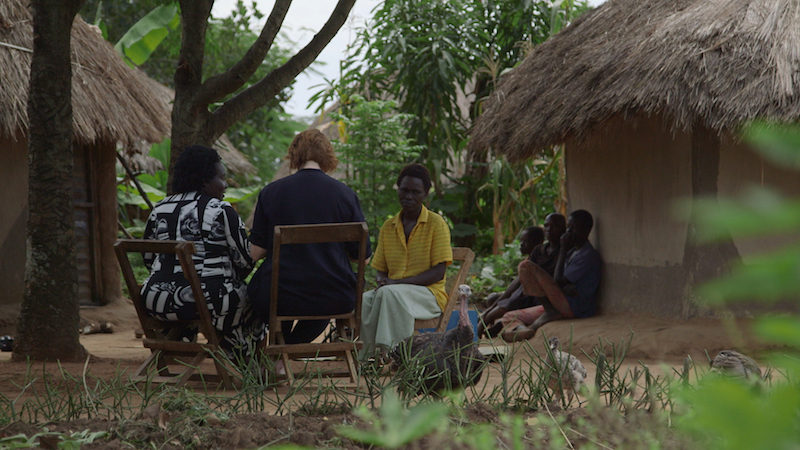 The children had left Uganda in December 2013—months before Florence and Jenipher knew that anything was wrong. What happened to Florence and Jenipher is not uncommon in Uganda or the many other countries plagued by fraudulent international adoptions. Unscrupulous brokers, weak institutions, and inadequate reforms have led hundreds, perhaps thousands, of children to be separated from their families in recent years. But an investigation by the Investigative Fund and The Nation, which involved the review of hundreds of pages of court records and interviews with roughly 50 social workers, lawyers, judges, agents, and families, shows that the amended law has fallen far short of its goal. In 12 cases of international adoption from Uganda to the United States between 2010 and the present, we located the biological families of each of the children, all of whom said either that they’d been tricked into signing away their parental rights or that the paperwork had been forged. We also tracked down the children’s new adoptive homes in America. The vast majority of these parents said they believed they were agreeing to let their children’s education be sponsored, only to learn later that they’d relinquished their parental rights by putting their mark on documents that they couldn’t read. Their stories illustrate how easy it is to create a “paper orphan” in Uganda for America’s adoption market, and how some US adoption agencies willingly ignore red flags. The State Department’s data on international adoptions runs from fiscal years 1999 to 2017. Over that period, there were 271,833 international adoptions in the United States, each at a cost of tens of thousands of dollars to the adoptive families. The top countries for adopted children were China (80,162), Russia (46,113), and Guatemala (29,806). Uganda sent more than 1,500 children to the United States over the same period. It’s impossible to know how many Ugandan families have lost children to foreign adoption who might otherwise have wanted to raise them. Indeed, the very concept of “adoption” in the Western sense—one that involves the forfeiting of parental rights—is so alien that there’s no equivalent word for it in the local languages. It’s unheard of for family ties to be permanently severed. Yet there is little recourse when a child is adopted against the biological family’s wishes. Once the child has left the country, the Ugandan government has no jurisdiction to intervene, even if the paperwork is later proved to be fraudulent. The US embassy in Kampala, which issues visas to adopted children, can delay the process or require a DNA test. But according to two consular officers who agreed to speak on condition of anonymity, if all the paperwork is in order, they have just two options. “The only thing the consular section can do is mark the adoption as either approvable or non-approvable,” said one in-country officer. If they suspect fraud and mark the adoption as “non-approvable,” the visa application gets sent to the Department of Homeland Security’s regional office in Rome. “But almost none are rejected,” the officer added. Florence (left) and Jenipher look at photos of their children on a tablet computer. In the United States, too, the safeguards are inadequate. All US adoption agencies working internationally have long been regulated by the Council on Accreditation, a nonprofit based in New York City and overseen by the State Department. Made up largely of volunteers, the COA accredits 2,200 organizations and programs that, according to its website, serve more than 7 million people. In order to be accredited, agencies must prove that they are financially sound and competent to evaluate prospective adoptive parents. Klarberg noted that the COA does have the power to suspend or terminate an agency’s accreditation if there’s a finding of wrongdoing. In 12 years of regulating international adoptions, the COA has cancelled the accreditation of only 11 agencies and suspended 17. Another check is the Hague Complaint Registry, operated by the State Department, which receives complaints about adoption agencies from adoptive parents. But many families aren’t aware of this registry, which requires that a complaint be filed first with the adoption agency itself. In 2015, we submitted a Freedom of Information Act request to this registry, asking for records on the complaints made about adoption agencies operating in Uganda. In one case, an adoptive parent in the United States reported that someone working for the Texas-based agency Little Miracles had coached the birth mother to lie in court. The complaint, which included that accusation, was marked as “substantiated,” and “corrective action” was ostensibly taken. But US law enforcement was never notified, and Little Miracles continues to operate in Uganda and several other countries. The COA’s Klarberg declined to comment; Little Miracles didn’t respond to our requests. The State Department also has the power to “debar” an adoption agency, and, unlike the COA, has the resources to conduct investigations overseas, either through in-country embassy staff or law enforcement. In 2016, the department temporarily debarred an Ohio-based agency called European Adoption Consultants for “a pattern of serious, willful, or grossly negligent failures to comply” with accreditation standards. Jenipher (left) and Florence have no recourse to get their children back from the adoptive families in the United States. Another Ugandan woman, Tabitha Abbo, has lost custody of not one but two sons to a family in the United States. In early 2017, she attended four hearings in Kampala’s High Court over the future of her younger son, Solomon Kasirye. Abbo did not have a lawyer, and she often could not understand what was being said: Court proceedings are generally conducted in English, which she cannot speak. On the opposing side of the hearings were Americans Laura and Philip Hunker, the prospective adoptive parents. Like many rural Ugandans, Abbo is poor and unable to read or write. Her native language is Dhopadhola, which is spoken only in the eastern part of the country. Abbo is slight of frame but muscular from farming maize and millet, and she’s strong of will—especially when it comes to her children. “I get so fierce that even a leopard is tame compared to me,” she said via a translator in July. Before Solomon was Michael, Abbo’s first son, whose story is fairly typical of international adoptions in Uganda. According to Abbo, she heard that some white people had come to her community to look for needy children to sponsor. Her husband had left her, Michael was sickly, and her in-laws were unable to help. The sponsorship seemed like a golden opportunity, so she didn’t think twice about meeting with the foreigners, and registered Michael with an orphanage in Kampala called Abato– Journeys of the Heart. What she agreed to, Abbo said, was that the sponsors “are to take care of the child while he studies, until he is 18 years. And that they bring him to me at home here in Uganda every four years so that I see him.” The adoption case file, however, shows that she put her thumbprint to documents ceding all parental rights over Michael to the Hunkers. Approximately three years after Michael was adopted, the couple heard that Abbo was pregnant again and decided they wanted to adopt this new child, too. Again, the situation was confusing to Abbo, as it began with what seemed to be well-intended financial support. She said the Hunkers sent her money for medical treatment and baby supplies, then paid for her to stay at a facility, Shared Hope for Orphans, when the baby, Solomon, was born. At this point, Abbo believed that Michael was still hers, merely studying in America. Tabitha Abbo has lost custody of not one, but two sons to a family in the United States. When Solomon was 5 months old and living with Abbo, the Hunkers and their adoption team were already making preparations to bring him to the US. His Ugandan court file includes a pre-adoption “home study”—a report about a family’s suitability to adopt—dated April 2016. Over the next few months, the Hunkers and their team swore to affidavits, obtained a letter from Oregon Senator Ron Wyden requesting the US embassy in Kampala to process Solomon’s visa swiftly, and gathered medical documents about the baby to strengthen their case for adoption. But their paperwork was littered with what should have been warning signs to the agencies involved. First, the Hunkers’ application to foster Solomon was signed by a Ugandan probation and welfare officer—the equivalent of a social worker—but not one from Abbo’s district. Furthermore, the Shared Hope for Orphans facility, where the Hunkers kept Solomon after they took him from Abbo, wasn’t even a registered orphanage. Later, Laura Hunker provided photos of Abbo thumb-printing a document in July in which she appears to consent to giving parental rights of Solomon to the Hunkers. For her part, Abbo said she endorsed the agreement because the Hunkers’ lawyer told her it was necessary to provide medical care to Solomon, who was sick, and that the document wasn’t legally binding anyway. Abbo said she didn’t see Solomon again until January 2017, when she was told by an agent for the Hunkers that she needed to go to court in Kampala. According to Abbo, since her child had been taken from her in “unclear circumstances,” she believed the court proceedings would return Solomon to her. Four hearings followed, at which the judge, Moses Mukiibi, repeatedly asked Abbo if she would consent to Solomon’s adoption. Mukiibi twice adjourned the hearings, first because Abbo didn’t understand “the full implications of an adoption,” and second because she “does not wish to surrender her position or rights as the mother.” At the third hearing, Abbo is recorded as authorizing the adoption. In February 2017, at the fourth hearing, the Hunkers became the legal parents of her baby. Mukiibi was also the judge in the cases of Florence and Jenipher’s children. In 2016, he presided over 20 cases of adoption and legal guardianship—an unusually high number given that, in mid-2013, he was moved from Family Court to the international crimes division of the High Court and has since been, in his own words, “on the periphery of the family-division activities.” But that didn’t stop him from setting an important precedent soon after the Children’s Act amendment was passed in 2016; he ruled in that if a foreign family hadn’t lived in Uganda with their foster child for one year but rather sent money for the child’s care, that counted as “constructive fostering” and thus satisfied the one-year in-country requirement. This legal reading puts him at odds with Stella Ogwan, the head of the child-welfare division in Uganda, who spearheaded the 2016 amendment. “The law is very clear,” she said. “You have to foster [in-country] for one year.” The notion of “constructive fostering” undermines the whole point of the amendment, Ogwan added, and does “a disservice to the biological families of these children. Journeys of the Heart, the Oregon-based adoption agency at the heart of Michael’s and Solomon’s cases, was involved in five of the 12 cases we investigated. An American adoptive family has said they found children lying in their own urine in Abato–Journeys of the Heart, the agency’s Kampala orphanage. The police even charged Barbara Ndibalekera, the woman who ran it between 2011 and 2013, with child neglect. After Ndibalekera was arrested and released on bond, she went underground. The police say she “absconded,” and that her file has subsequently gone missing. In an interview at an undisclosed location, Ndibalekera said that it was her job to find children for adoption, regardless of whether they were orphans or not. She added that David Slansky, the director of the Oregon agency, put enormous pressure on her to bring children into Abato and would threaten to close down the center if the adoption pipeline slowed. Once she had a child in the orphanage, Ndibalekera would gather all of the paperwork that the court required to grant an adoption. If a child had been genuinely needy, this documentation would have already existed—for example, if a family couldn’t care for a child, then a probation officer would have written a report recommending that the child receive alternative care. But Ndibalekera admitted to paying money to officials to “facilitate” the production of these documents, something she alleges the American adoptive families were sometimes involved with. Florence and Jenipher’s kids all have new names now. After nearly five years in the United States, they have American accents, but they’re very curious about the land of their birth. Their new family said they believed the cousins were siblings when they adopted them and described them as “joined at the hip.” According to their American father, the children don’t know about the anguish of their parents back in Uganda, and he and his wife agreed to speak only on the condition of anonymity. They don’t want what happened to them happening to other families, but they’re also unwilling to give the children back. The couple had used a New Mexico–based agency; the father told me that the process went smoothly. They said they had met Mariam in person, and they believed she was giving up her children “for poverty reasons.” They added that there were no concerns raised in court or at the US embassy, which typically checks birth certificates and which had interviewed Mariam. The embassy’s and the State Department’s press offices both declined to comment. Again, what actually occurred can’t be proven, but some paperwork was either inaccurate or absent from the file. The birth certificates, which would have named the parents, are missing. The probation officer’s report and the local chairperson’s letter, both a requirement for adoption from Uganda, incorrectly list Mariam as the children’s birth mother. The file includes an affidavit sworn by Mariam that she is the biological mother. Florence and Jenipher are now at the mercy of the adoptive parents. Meanwhile, Rose Patience’s birth father has accused Florence of “selling” their daughter and refuses to let her see their other three kids. According to Florence, one fraudulent adoption has cost her four children. She says she “can never be happy” again. Ogwan at Uganda’s child-welfare division said that the government took Solomon, not because of a US embassy employee but because Abbo filed a complaint. For now, the Ugandan government has physical custody of Solomon. Officials are investigating his case and will determine whether the adoption order might be revocable because of “fraud or misrepresentation,” pursuant to the amended Children’s Act. Anna Cavell is an investigative journalist based in East Africa. Her work has covered human rights, conflict, economic and social issues.